Mobile websites are sites designed specifically to be accessed on mobile devices, like smart phones and tablets. If you have a website, chances are that many people are viewing your site right now on their mobile phone. The good news is, you have a website. The bad news is that traditional websites, even with some smart adaptation, are just not made to fully utilize smart phone features, like click to touch, calling, navigation and email or text features. If you’ve had the awkward experience of trying to navigate a clumsy, big site on your smart phone, then you’re halfway to understanding the importance of delivering quick, easy to access information. And this is where the third factor comes in as a reason for getting a mobile site—at least some of your competitors have mobile sites, delivering a better customer experience and making it easy for customers to find, call and purchase what they seek. There are two key elements for any business owner to look at when it comes to considering a mobile site. First off, it’s where your customers are. According to Gartner, by the end of 2013, more people will use their mobile phone than desktop computers to get online and 99% of mobile users look up local information on their devices. Secondly, 88% of local info seekers make a purchase within one day and 90% of these people act within 24 hours. This means that not is mobile where your customers are, but it is where they are when ready to act on a purchase choice. Many mobile sites use MDot technology, that is to say a mobile referring address that recognizes the device and delivers a mobile-friendly version of your WWW site to smart phones and tablets. Fees to edit or convert a traditional website to a mobile site vary, as do hosting plans. There are DIY editors, free services and upscale build-from-scratch systems. There are hybrid conversion systems that analyze available materials and assist in the conversion process. Some platforms, such as Word Press, offer Plug-Ins that recognize a mobile user and deliver a mobile-friendly site. The caution here is that a mobile-friendly site is not a mobile-enhanced site, with thumb-able, click-to features and a high degree of optimization. Two years ago, the rush was on to develop smart phone applications. This now has become a distant second to high-performing mobile sites in addressing business needs. Apps provide services. Mobile sites drive customers to your business in a single step. Google is deeply invested in seeing the mobile future evolve. In late 2011 Google launched a mobile education initiative to assist in transitioning businesses to mobile. Google’s howtogomo.com provides the basics, statistics and samples of mobile sites. Mobile site investment is pretty minimal in most cases, compared to the potential returns. A rough guess-timate of costs by this author would be from $200- $800 for mobile site conversion from start to finish, along with annual hosting fees. Free or really inexpensive sites are out there to be found, but do not offer the premium smart features, control or freedom from advertising that is essential in a successful site, not to mention the technology learning curve in managing such a process. 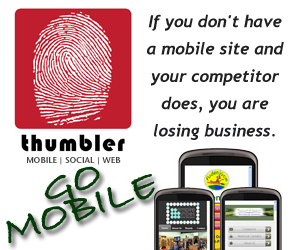 A 2011 survey by Compuware, notes that 40% of users have turned to a competitor’s site after a bad mobile experience. Listen up, pick up your smart phone and get ready to go mobile.